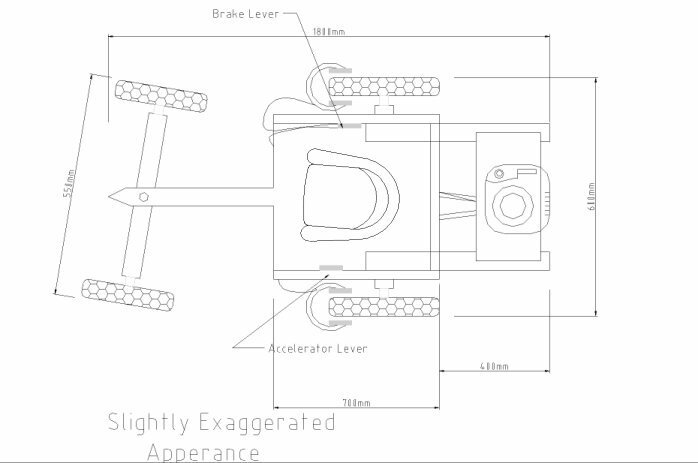 Basic Appearance/ Plan of the most Basic wooden kart as described in the plans. Basically what you are seeing is a very simple wooden kart constructed from regular pieces of timber. The steering is crude but simple. Front wheel are simply spinning on a fixed axle with washers and pins holding them on. Steering can be achieved using one's feet to turn the main arm or a length of rope can be used. The back axle can spin freely in bushings/ pieces of piping with a large drive pulley wheel in the middle of the axle. The engine is positioned at the very rear of the kart and simply held in place. Basically a simple drive belt similar to one in a car's engine runs from the engine on the back to the large pulley wheel on the rear axle. The belt has to twist continuously through 90 degrees to accommodate the lawnmower engine. This lends itself to heating of belts etc. and wear of belts. Brakes are simply taken from any bicycle and fitted on a runner, positioned in the correct place and bolted to this runner running under the kart. Well that's the basic outline. The plans to follow are secondary to this main idea and appearance of this kart. Rough measurements are shown above.